Financing is available for properties that are located outside of certain metropolitan and suburban areas. However, first time home buyers may be attracted to low-down payment mortgage products from the FHA or conventional sources that might not qualify for rural financing. Perennial Funding offers competitive interest rates for USDA mortgage loans. The U.S. Department of Agriculture offers government-backed mortgage loans to approved borrowers who want to finance qualifying properties. As a premier option for financing rural properties, USDA mortgage loans are ideal for borrowers who need to finance properties with more than five acres or to finance properties that are located in areas for rural development. As long as a buyer is purchasing a property that is a nonworking farm, a USDA mortgage loan offers favorable financing solutions. Shown below are some of the benefits of USDA home mortgage loans. No down payment is needed for qualified borrowers. Up to 50 percent of a borrower’s income may be used for qualifying purposes. 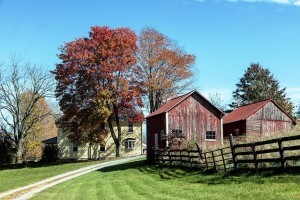 Attractive mortgage interest rates for rural properties. Flexible credit requirements to get approved for a USDA home loan. Competitive private mortgage insurance rates. Funding time frames are typically less than 60 days. Extends financing to approved borrowers with low incomes. Prior to shopping for a home in a rural area, buyers can discuss various financial options with a licensed loan officer. For instance, it’s wise to have a financial snapshot that reflects the maximum loan amount and the approximate monthly payment for a 30-year mortgage term. By completing our online mortgage application, one of our licensed mortgage professionals can review the initial details for a loan request and determine whether a financing opportunity exists. Either way, we communicate our findings with all applicants. To secure an approval for a USDA mortgage loan, a borrower will need to provide additional documents, such as recent pay stubs, bank statements and tax returns for the preceding two-year period. Working with an experienced team of lending professionals is encouraged for home buyers who are interested in obtaining a USDA mortgage loan. We employ loan officers who are knowledgeable and eager to assist local home buyers. Contact Perennial Funding today about buying a home with a USDA mortgage loan or about refinancing an existing USDA home mortgage loan.